Ricotta Parmesan Chicken over Spaghetti is a delicious and easy Italian inspired dish that your family will love! Serve over pasta or even zucchini noodles for a healthier version! Fresh breadcrumbs are a must for baked and breaded chicken. Dry crumbs just aren’t the same. I like to keep the heels of my loaf bread in the freezer just to make breadcrumbs. If you make a big batch of crumbs put them in a zip top bag in the freezer and they’ll always be ready! So here you go. My “go-to” Ricotta Parmesan Chicken over Spaghetti. A meal everyone loves and, more importantly, a meal that comes together quickly and easily. Preheat the oven to 400. Boil your water for the pasta and put your marinara on to warm up. In a small bowl mix your ricotta and milk together well to thin out the ricotta a little. Next, pat you chicken dry and arrange them on a baking dish. Spread each breast with a couple tablespoons of ricotta each. Sprinkle each breast with salt, pepper, and dried basil. Grate the Parmesan and make your breadcrumbs in a food processor. Add the cheese to the breadcrumbs and lightly season with salt and pepper. 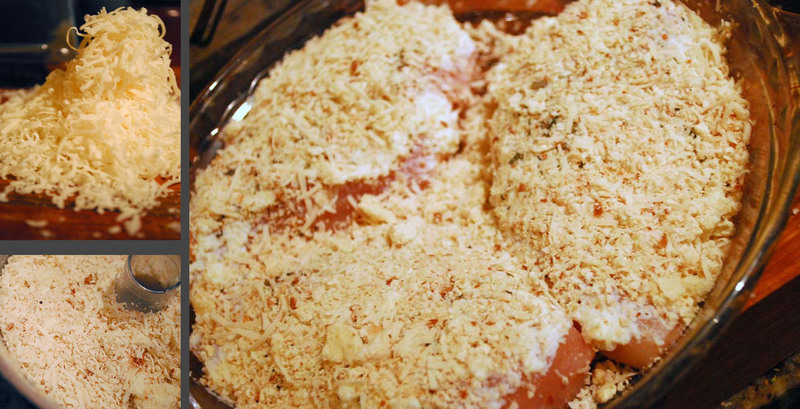 Sprinkle crumbs over chicken breasts liberally. Press into chicken to ensure a good stick. Bake in the oven for 20-30 minutes or until juices run clear. Cook the angel hair. Slice the chicken and serve on top of pasta with a healthy ladle full of marinara sauce. Ricotta Parmesan Chicken over Spaghetti is a delicious and easy Italian inspired dish that your family will love! I really like your recipe! I will be bookmarking to try this soon…thank you! p.s. found you on Tastespotting! Simple and tasty pasta recipe – just how it should be! I love this idea and will definitely be trying it! That is a great way to use ricotta. It looks really good. Ricotta on the outside of the chicken? Genius idea! Saw the pic on Foodbuzz and couldn't help clicking! Looks so delicious i want that for dinner tonight. Warning: Do not try to pan fry this! Looks great Jodie! I tried your chicken and beans dish yesterday, it hit the spot. Are you starting your garden in your neck of the woods ? I’m so glad you tried that chicken recipe! We have started our garden. I’ve just got Spring stuff in there now – peas, lettuce, broccoli, etc, but we will be putting squash and beans in soon. Then tomatoes. Fingers crossed for a good season! How about you? Have you got your garden going yet? Hi Monica! I’m so glad you love the recipe! I’ve just added the nutrition data so you can have that info. It does include the pasta, but if you wanted to take that out you would simply subtract the totals from the package of pasta. I hope this helps! Thanks again.